Cryotherapy may sound like it’s from a science fiction film, but it is a highly effective treatment that helps you get out of pain, sleep better, and recover faster. Most people experience a significant reduction or elimination of pain after only one session. It helps reduce inflammation, which can cause joint pain, and it helps the body release toxins that build up over time. Everybody is different, yet the effects cryotherapy are cumulative. The best results are gained after receiving at least 2-4 treatments in the first week and then weekly thereafter. Athletes often treat 1-2 times per day when training for a sports event to enhance muscle recovery from training. Many professional sports teams have replaced ice baths with cryotherapy for recovery. Causes of chronic pain include: dehydration, overtraining, not planning enough recovery time, allergenic foods, chronic infections, and stress and trauma. Results are enhanced if you supplement Cryotherapy treatments with greater hydration, diet improvement, regular exercise, supplements and reducing stress. 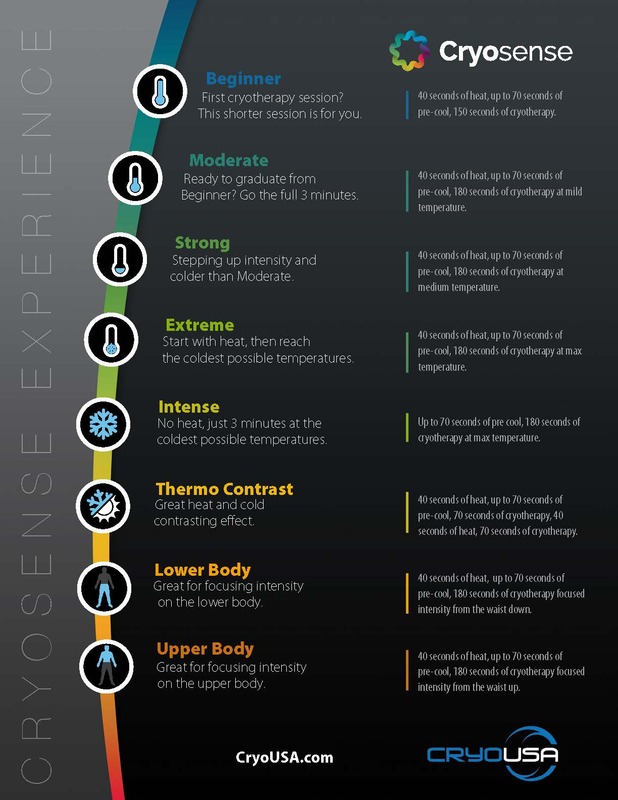 What is a cryotherapy session like? A cryotherapy session involves standing in a metal tube for 3-4 minutes while liquid nitrogen is pushed into the air all around your body. Your hands and feet will be covered with gloves and socks – and men wear their briefs/shorts. It is not uncomfortable, but you will feel cold. Your head is out of the tube, so people with claustrophobic tendencies are usually just fine. You’ll be advised to drink plenty of high quality water before and after each session. When used properly, it rocks! Ready to try cryotherapy? Book your appointment below. Be sure to also check out all of our other therapies that can be used in conjunction with cryotherapy. Cryotherapy FAQs. Click to Enlarge!